Syrian Deputy Prime Minister and Foreign Minister Walid Al Moualem, left, shakes hands with Indian External Affairs Minister Sushma Swaraj in New Delhi, India, Tuesday, Jan. 12, 2016. 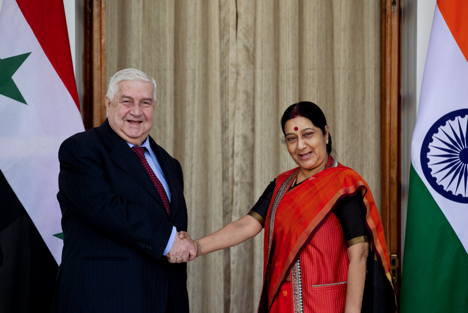 Sushma Swaraj and Walid Al Moualem discussed Russian actions against Daesh in Syria. Indian Foreign Minister Sushma Swaraj and her Syrian counterpart Walid Al Moualem discussed the Russian military campaign against the Daesh, also known as ISIL/The Islamic State jihadist group in Syria, with Swaraj being pleased that it was achieving results, an Indian ministerial source told Sputnik Tuesday. Muallem, who also serves as deputy prime minister of Syria, arrived in the Indian capital of New Delhi on Monday for a three-day visit. "Syrian Dy PM and Foreign Minister discussed Russian action against Daesh in Syria with Foreign Minister Sushma Swaraj. She was happy to know that they are achieving results," the source said. Syria has been locked in an armed conflict since 2011. The government of President Bashar Assad is fighting against several international Islamist groups, as well as a number of opposition forces. Since September 30, Moscow has been conducting pinpoint airstrikes in Syria on the positions of Daesh, a terrorist group outlawed in Russia and many other countries, at Assad's request.